I really like the Advice Column Mystery Series by Roberta Isleib. 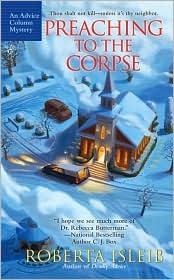 Preaching to the Corpse is the second book in this three book series. In this segment, a member of a church team charged with hiring a replacement minister is murdered and Dr. Rebecca Butterman is called in to counsel the minister who found her and may or may not be a suspect and to replace the murdered woman on the committee. Detective Meigs features prominently in this book as he did in the first, although perhaps not in a way you would expect. Although I am not at all religious and often find religious themed books insufferable this book managed to have a church related mystery without being preachy. I like the character of Dr. Butterman as the sleuth a great deal, she uses her background to analyze the suspects in a believable manner. I really liked the resolution of the Rebecca and Meigs storyline and Rebecca’s personal life in general. The mystery was well done and I didn’t guess the culprit at all, in fact I had a completely different idea for at least part of the book. This series does not necessarily “read” like a typical cozy but it is lighter mystery with interesting and updated themes. I will be finishing the series with the third book when it comes out on Kindle. 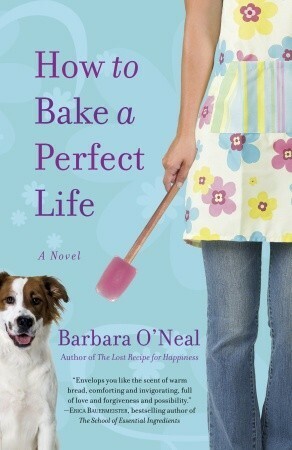 How to Bake a Perfect Life is a women’s fiction selection told from varying viewpoints. Ramona is a single mother of an adult married daughter, Sophia, the result of a one time encounter as a young teen. Sophia is pregnant with her husband’s child while her husband is deployed, and Katie is Sophia’s step daughter who needs a place to stay while her mother is incarcerated. Ramona is also the proprietor of a struggling bakery business located in a town in which her family owns a series of food related businesses organized under the management of her estranged father. This was an okay read. I really didn’t get the whole estrangement thing, it seemed she was picking and choosing, blaming the family for siding with her ex in one breath and then still having relationships with her mother and brother in the next. I just didn’t really connect with the characters to a point where I cared about them. I thought your review of How to Bake a Perfect Life was spot on. I liked it but it needed something else for a closure with the characters. I have nominated you for the Sisterhood of the World Bloggers Award. Check out my site.